Athletic Director Patrick Nero has signed a contract extension through the 2020-21 academic year according to an athletics department release. Hatchet File Photo. Fourth-year Athletic Director Patrick Nero has signed a contract extension to remain at GW through the 2020-21 academic year, the athletic department announced Monday. Nero, who replaced former athletic director Jack Kvancz in 2011, has seen GW sports through the first years of the five-year athletics strategic plan he and the athletic department released with the approval of the Board of Trustees in 2012. He has seen nine of GW’s 27 intercollegiate teams win championships in his time at GW. “Without the University’s support, along with the tireless, hard work and dedication of our student athletes, coaches, administration and alumni, we would not have been able to pursue the many opportunities and achieved the successes that a multitude of our programs have seen,” Nero said in a release. Nero has prioritized the academic success of student athletes and development in the athletic department. GW student-athletes have set all-time high marks in GPA and community service hours during Nero’s tenure and the Providence, R.I. native was the driving force behind establishing the Buff and Blue Fund. Gifts to the fund, which is housed within the new Athletics Development unit, have supported facilities like the men’s and women’s basketball locker rooms and Tucker Field at Barcroft Park. Donors have also contributed to foreign travel for athletes, like the women’s basketball team’s trip to England and France last summer. 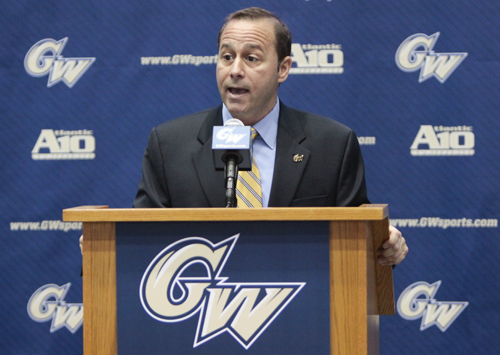 “Patrick’s strategic vision and his efforts to ‘build champions in the classroom, in competition and in the community’ have helped to push GW Athletics further, and our future with him at the helm of our athletics department is bright,” Provost Steven Lerman said in the release. Nero graduated from Providence College in 1987 and served as the Commissioner of the America East Conference before signing on at GW. He is currently the Chair of the Atlantic 10 Council of Athletic Directors and serves on the NCAA Division I Men’s Basketball Issues Committee.